GET THE SAFEST EXPERIENCE WITH THIS PROFESSIONAL COOKING TORCH. The Noor Fire Flame Cooking Torch is designed for safety with locking ignition to protect children from accident. It's comfortable to use and great for Barbecues and searing. We always use it to make our favorite Creme Brulee. You'll love the convenient adjustable flame. And you know this is built with quality thanks to the non-corrosive aluminum tank and the stainless steel flame guard that will never rust. Add to that the impressive 50 minute burn time and you've got one of the finest culinary torches on the market. Just what you need for your outdoor grill, kitchen, or camp site. IMPORTANT SAFETY INFORMATION: Keeps your kids and pets always from the flame when in operation. Don't set down when continuous flame is on. Keep an eye on the flame at all times. Don't touch the nozzle right after use. It's hot! Let it cool before putting the torch away. Be sure to tell children this attractive torch is a not a toy and for adult use only. Keep the flame and hot parts away from face, skin, clothing, paper, wood, and plastic. 100% MONEY BACK GUARANTEE ensures this will be your best bet for a no-risk purchase. Many people love this torch so much they return to buy 2 or 3 more. HURRY AND BUY NOW while we have these in plentiful supply. This makes a much appreciated gift for friends, family, and co-workers - anyone who wants a premium professional grade cooking torch. OUR SAFEST CULINARY TORCH lets you makes wonderful seared meat, fish, and scallops. Kids will love the toasted marshmallows. Healthful and delicious char grilled vegetables, glazed fruit, and flaming cocktails to impress guests. Awesome for lighting grills, fireplaces, stoves, or camp fires. POWERFULLY HEATS UP TO 1,250 degrees Celsius. That's a whopping 2282 Fahrenheit! Burns for 50 minutes or recommended 5 minutes continuous. That's plenty of flame and intensity to make just about any dish, favorite food, or treat you can think of. 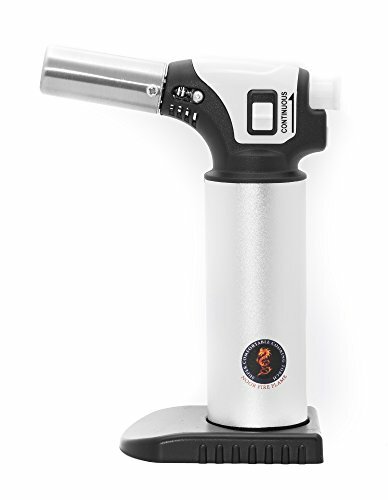 The is the ultimate professional grade culinary torch. EASILY REFILL WITH BUTANE. Check local stores for butane gas for lighters. Takes just seconds to refill for another 50 minutes of exceptional flame. This durable torch will be one you use again and again for many years of enjoyment. Size 12.9*63*17mm. LIGHTS EASILY EVERY TIME with built in Piezo Ignition. No making your finger sore with old stubborn lighters that spark but won't light. This torch lights up and rises to full heat in just seconds. Super convenient helping you prepare wonderful meals that will thrill everyone in the family. 30 DAY MONEY BACK GUARANTEE will quickly make this your favorite no-risk purchase. Many people are stocking up with 2 or 3 of these outstanding Noor fire flame cooking torches. HURRY AND BUY NOW while we have a big shipment in stock. Makes a fantastic gift for friends, family, or co-worker - anyone who wants a very high quality culinary torch. View More In Cooking Torches. If you have any questions about this product by Noor Fire Flame, contact us by completing and submitting the form below. If you are looking for a specif part number, please include it with your message.